Technology reviews, news, opinions, and competitions. SYNAPSE CIRCUIT: 2013: A REVIEW. PART FOUR: THE RISE AND RISE OF GOOGLE. Give us a break! Give us a 64bit KitKat! Here's something I made earlier... Too bad it's available in the US only! Good late afternoon / evening, Synapse Circuit Readers! What’s happening with you? Right now I am happy to be sitting in the warmth of my home office while a storm continues to rage outside! So much for a white Christmas! Well, I hope tomorrow will see the storm go away as there is one more day of Christmas shopping to do and contend with! Here I am, again, looking at what I see as the highs and lows of 2013’s world of Tech! PART FOUR: THE RISE AND RISE OF GOOGLE. While Samsung are actively putting out a mass of handsets and tablets and running away with the Android ball (out of all the other manufacturers on the playing field) it is all down to Google and their awesome Android operating system. In a nutshell, Google has given all manufacturers a blank cheque and they seem to be doing remarkably well! Yes, I was moved by Larry Page’s speech that he gave at the i / O conference of this year. I love the fact that he’s not into creating rivals but unity through technology! And what’s more is that Google are doing their best to provide that bridge across the different platforms. Google is like the Karate Kid to the Apple and Microsoft rivalries that will take very opportunity to let slip a verbal attack. It’s one of the reasons I find it painful to watch an Apple product launch, “Pointless smarmy attack, pointless smarmy attack, pointless smarmy attack... Oooh, we’ve opened a new shop somewhere in the world and it’s fantastic... Smarm, smarm, smarm...” That’s boring to me! 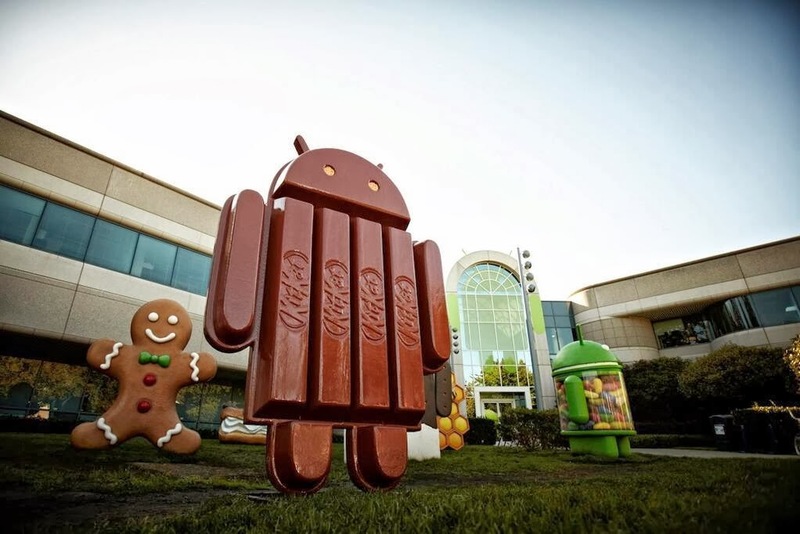 We are seeing the Android operating system go strength to strength with the release of KitKat, 4.4! I think many, many mobile phone users in general do not stop to think about the role of Android in the mobile devices world. Android drives a myriad of handsets and tablets that come in different sizes which is a phenomenal achievement. Perhaps the consumer doesn’t look into the phenomena aspect and is more interested in having a choice. However, many budget handsets have been mis-sold by unscrupulous retailers... We’ll get to the budget Android handset in a bit. It is purely down to Android why there is a budget market for handsets. I can’t imagine a world whereby the only choice is the iPhone or the dire Windows phone! And thank God that I don’t have to imagine such a world where I am forced to buy an over expensive iPhone or a half-baked Windows handset. In the not too distant past there were some very cheap Android handsets on the market that costs anywhere from £50 to £99! They looked promising and we were told that apps could be saved on a microSD card when we paused to consider the lack of memory and storage on these cheap phones. We spent our money on these handsets in order not to be left out with the hordes of people busting out their iPhones, Samsungs and HTCs or to replace a broken handset. In a nutshell these budget handsets were a load of horsepoop! Only a select few apps were able to run from the microSD card and not before downloading an app to do that! Then there was an issue of speed... Forget it! Thankfully, Google Motorola gave us the Moto G! The Moto G came out just in time to save the world from these awful budget handsets that gave people the wrong impression of Android. The faith in Android, budget Android, has been restored. Amen! Because of Google Motorola there will be more decent budget handsets to be had next year! Watch out! Of course, Google and LG brought us the Nexus 5 for a very reasonable price. The Nexus 5 is not quite Galaxy S4, One or G2, but it is a great budget alternative for those who want a reasonably powerful handset at a good price. Both the Moto G and Nexus 5 flew out of the mobile retail outlets here in the UK – specifically London! Yes, indeed what a turnaround for Motorola – Google Motorola! The Moto X was slightly disappointing simply because the teaser advertising made it seem as though consumers would be able to customize the innards i.e. processor, memory, etc. However, the good thing about the Moto X is that it is manufactured in the USA and I am sure that it helped to provide jobs for citizens in this wake of an uncertain economy. Another good thing is, of course, a degree of outer customization. I am sure that the Moto X sold well – especially with the touch free command feature! Well, you could hardly say that Motorola were doing badly; they had a good hit with the RAZRi and HD but such handsets were not quite on par with the premium beasts from Samsung, HTC, LG, Sony and so on. I think the adoring handset fans are looking for the Motorola equivalent of let’s say the Galaxy S4 and when they don’t get it they have ruled Motorola out of the big league so to speak. It begs the question: What does 2014 hold for Google Motorola? Will we see cheaper more powerful handsets? Will we see a flagship decked out with the largest cores, RAM and storage? Will they do a phablet? We’ll just have to wait and see! Now just look at what is happening with Google Chrome! The web browser keeps getting better now with search via voice and the mobile browser offers the best Internet surfing solution – more so than the standard web browser that comes with handsets these days! Then there’s the Chrome OpSys that has seen the release of a new Chromebook from Acer and the decked out Chromebook Pixel! Wow! Who wouldn’t want a Chromebook Pixel? 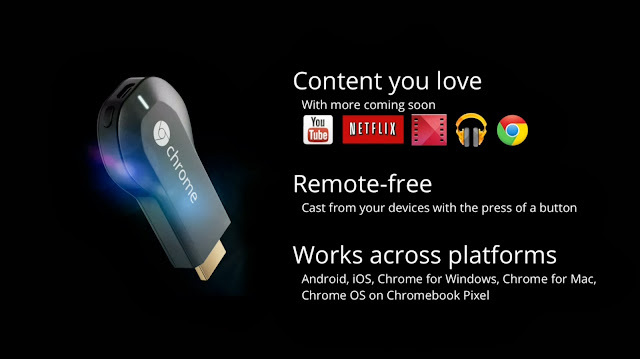 And the surprise hit for Google has not only been the second generation Nexus 7 but the Chromecast dongle that allows you to stream audio / video to a connected device such as a HDMI compatible TV / Monitor! It costs a mere $35! I am just waiting for it to come to the UK or I might just order one from the States! I can see that the scope for Google is vast come 2014! What I envisage for 2014 is that Android goes 64bit; we’ll see more of a range of wearable devices; dual Android and Chrome tablets and PCs and possibly cost effective exoskeletons for those that have problems with mobility. The cost effective exoskeleton would certainly come in handy for people that lift heavy products as part of their jobs and / or for lifting patients in a hospital / hospice. Bring it on! From Motorola I see that there will be a range of mobile devices that can be put together in a Lego-like manner possibly towards the end of 2014! Well, I hope you have enjoyed this instalment of 2013 in review! Please check out the Synapse Circuit website for video, i-PDF and more! SYNAPSE CIRCUIT: 2013: A REVIEW. PART THREE: THE DEATH OF BLACKBERRY. Good evening, Synapse Circuit Readers! How are you? I hope that I have helped you in choosing gifts this Christmas as I am sure I have done last year! Here I am looking at what I see as the highs and lows of 2013’s world of Tech! PART THREE: THE DEATH OF BLACKBERRY. Oh my goodness!!!! What happened to BlackBerry, huh? I guess it was a case of too little too late. BlackBerry was slow to react to the innovation of the iPhone and the onslaught of the unstoppable phenomenon Android! It was an exciting touch and go period in which there seemed to be some contemplation as to whether they were going to go Android or stick with their own technology... Then there was a denouncement of Android and the rest is history! Literally! I thought that all this fighting talk from BlackBerry was going culminate in a killer device and operating system... ...alas, no! When I tested the Z10 I was left a little dumbfounded as it was not what I was expecting. You can’t slate another operating system and come up with something less than! Aside from that they made some interesting moves and brought in none other than recording artist Alicia Keyes as a Creative Director – or something like that! I have a few Canadian friends who asked me if the Z10 was worth upgrading to and no matter what I told them they were going to remain patriotic to BlackBerry but to their detriment. My Canadian friends now wished that they had gone Samsung! Well, that’s what they told me! Never mind... Perhaps all is not lost as BlackBerry is still quite popular amongst school children here in the UK! As you know by now BlackBerry has announced over $4 billion profit loss! It is doubtful that they can come back from taking such a huge loss! How many thousands did they have to lay off over the last couple of years? Was there at least one or two ex-employees looking at the mobile phone market? I guess not! 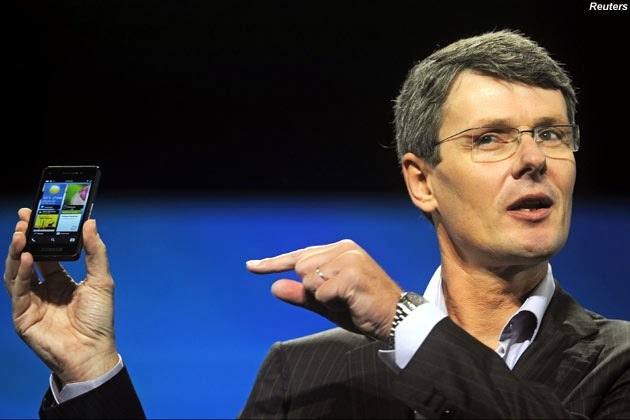 Yes, it was mighty brave of BlackBerry to stick to their guns but they were firing blanks! I wonder if there is still a chance for BlackBerry to come back with an Android handset and a put together an overlay not too dissimilar to Samsung’s TouchWiz with their very own widgets! I think there is a slight possibility! I reckon it would be easier for BlackBerry to see what Android market is doing in terms of delivering powerful handsets at a great price... Now, if BlackBerry can produce a decent quad-core Android handset for around $150 they could make a dramatic comeback in the history of tech! SYNAPSE CIRCUIT: 2013: A REVIEW. PART TWO: THE FALL OF APPLE. 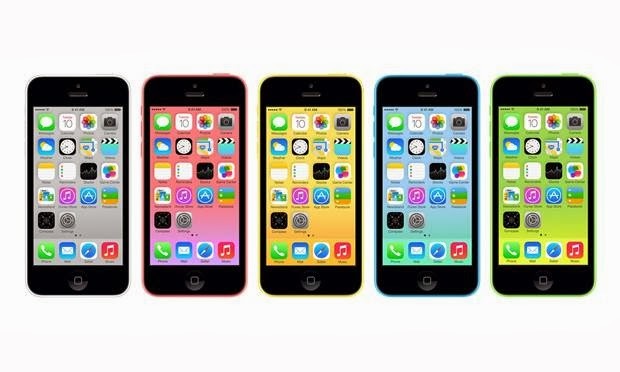 The united colours of Apple iPhone 5C. See? PART TWO: THE FALL OF APPLE. Every time I see an article on Apple it usually begins with something along the lines of, “Samsung are good at copying our technology...” YAWN!!!! That just bores me rigid! I can’t go beyond those opening lines! Apple has yet to put out a phablet or come anywhere close to 5” on the iPhone. Apple aren’t as innovative as they once were; fact! And it is that fact that Apple can’t deal with, so they take it out on their successful rivals, Samsung. Never mind the stupid lawsuits over trivial claims to screen interactions such as pinch to zoom, etc. Apple didn’t have anything in the tank and no amount of settlement due or undue from Samsung can hide that fact. Apple just can’t take the competition and it is such a shame to see adults behave in this manner. I think that Apple needs a new CEO to steer them out of the hole that Jobs have dug them into. Cook keeps on digging deeper and deeper. 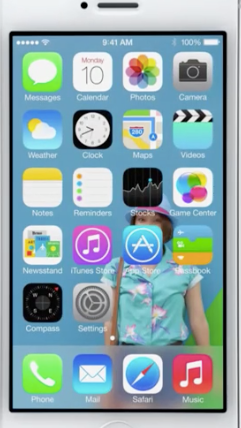 Apple will just look like they are copying when they release iPhones with larger screens. How will those ads regarding ‘Hand Science’ go down in the future? I think those ads will go down as a laughing stock in the history of tech. Just about every high-end Android handset beats the iPhone 5S hands down! I am sure there’s an unintentional pun in that last sentence. The Samsung Galaxy S4 and Note 3 reign supreme! Even the HTC One trumps the iPhone in the design steaks where aesthetics are concerned! Fingerprint ID is an old idea that has been jettisoned by Motorola! Apple hasn’t done enough! Ok, the 64bit architecture is good but I have yet to hear of anyone saying that it is a major improvement over last year’s model. I honestly think that 64bits on the iPhone is like the quad-core on Android. There could be more potential for 64bit on Android and from what I have understood, Google are looking to bring 64bit to the Android operating system. Samsung are just waiting in the wings to do something with 64bit technology! While they (Apple) smirk at the tablet efforts from Android manufacturers and Microsoft they have essentially devalued the iPad with the iPad mini. Nobody in their right mind would want to throw over £400 at a tablet just so that it can out of date the following year. That £400 could go to better use on a Windows laptop! Sure, it does not look as chic and up-to-date as carrying a tablet around but you will be more productive knowing that you have access to real software. The Apple tablet is just the king’s new clothes! Now the iPad mini is a better more affordable option but the Google Nexus 7 2013 offers the better screen and for a lower asking price. I think Apple is blowing hot air which steams up the retinas! And this is the reason why Apple has lost the tablet (and phone) battle against Android! If I wanted to I could go out and get any one of the range of available Android tablets for around £200 or under. I can even get an Android tablet with 3G added for less than it would cost for an iPad mini! Apple just seems to be all over the place. I really hope that they will improve and give their followers what they want: bigger screens and an end to the bickering! Oh, the need a new CEO with better ideas! Again, Steve Wozniak ought to take over the reins so that Apple mobile devices can benefit more from Google technology! Let’s not forget that Google Maps helped them out when Apple Maps were sending people to destinations unknown! Apple needs to open up and share! Roll on 2014 for Apple! SYNAPSE CIRCUIT: 2013: A REVIEW. PART ONE: THE YEAR OF SAMSUNG. The Majestic Galaxy Note 3! PART ONE: THE YEAR OF SAMSUNG. GALAXY S4 & GALAXY NOTE 3: WINNERS OF HANDSETS OF THE YEAR. SAMSUNG: BEST MANUFACTURER OF THE YEAR. SAMSUNG: BEST INNOVATORS OF THE YEAR. BEST MOBILE PHONE DESIGN OF 2013: Galaxy S4. BEST PHABLET OF 2013: Galaxy Note 3. I think it is pretty safe to say that Samsung has practically sewn up this year for mobile technology – let alone audio / visual. The Galaxy S4 is undoubtedly a great handset that surpasses the iPhone 5S easily! The 5” Super AMOLED full HD 441 ppi screen is awesome! The 13MP camera is fantastic for photos and video. And despite the reservations expressed by some over TouchWiz I think it’s the most developed of all the Android skins: it works! The quad-core CPU shifts! Now about the design... ...yes, you probably think that the design award should go to HTC but as beautiful as the One is I think it is not very practical. The fact that the Galaxy S4 packs so much in and can retain a removable battery is very, very remarkable indeed! Sure, the design is not as flash in its outer appearance but it is designed for practicality / usability. It’s perfect in its minimalism. 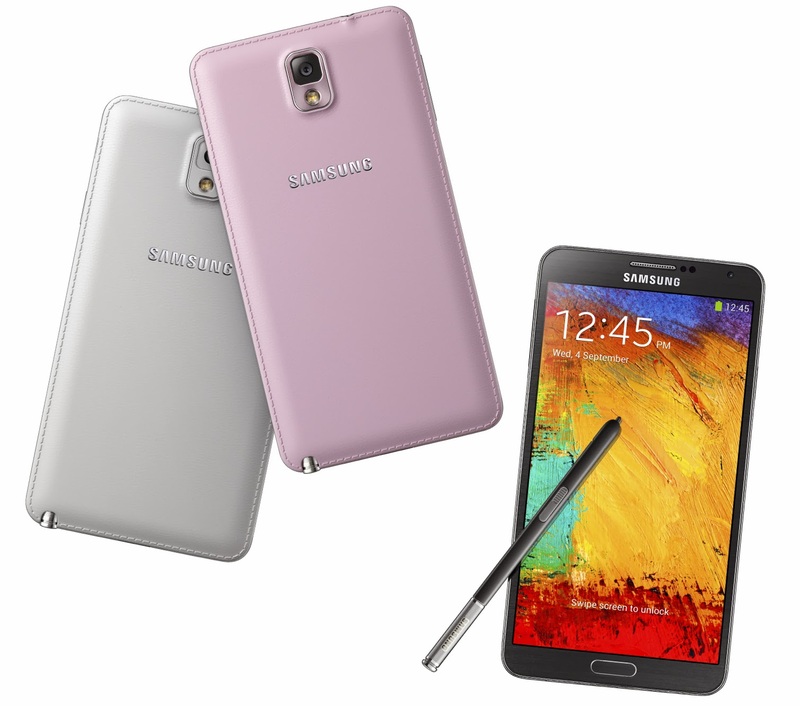 The Galaxy Note 3 has yet to be bettered by any manufacturer! Apple doesn’t have a reply! Well, not yet at least... Once again, you can remove and replace the battery! The camera is superb – recording 4K video 30 frames per second and full HD at 60 fps and the S Pen is an outstanding way to interact with this beautiful device! Come on... ...what’s there not to like about this superlative handset? The size?! It’s only 5.7”! Yes, size matters because I am seeing more and more women using this device! Lol! It’s true! On my travels I am seeing women on public transport whipping out their Galaxy Note 3 devices like it’s second nature! And that’s how it should be! I feel so left out because I would love to have a Note 3! My contract with my Note 2 finishes this time next year, so at this rate I am looking at a Note 4 or 5! There’s already talk of the S5 and Note 4 making an early appearance next year; the CES 2014? Who knows for sure? You can never quite tell what Samsung is going to do! I have heard that they aren’t very pleased with the over 40 million sales of the S4 and would like to sell even more so the pressure is on for the Galaxy S5! We’ll see... But when I do the research and talk to the mobile phone outlets in the UK (naturally I can’t go to each and every shop) the Galaxy S4, S4 Mini, Note 3, S3 and S3 Mini come out as the top sellers then it is a scramble between the HTC One and Sony Z1. Then, of course, it’s the Google and Motorola handsets that are currently flying out of the stores! The Nexus 5 and Moto G handsets are flying out the retail outlets that stock them! Gosh! What I don’t want is for Samsung to feel pressured into using metal for the S5 – especially if it means a non-removable battery! The only way I could live with a non-removable battery handset from Samsung is if they upped the ante on the battery duration! If the future battery could last at least 3 days on a single charge with reasonable usage then I wouldn’t care too much about not being able to remove the battery! However, what I would care about is a dent or a scratch if I were to drop the metallic handset accidentally! I have seen battered iPhones and they do not look nice at all! I would prefer Samsung to use rubber! I am serious! A rubber skin that can easily be replace when worn out! And because the display would be flexible I wouldn’t need to worry about a cracked screen! Please, Samsung! Are you reading this???? Y’know, I get the feeling that the CEO of Samsung, Kwon Oh Hyun, wakes up and thinks to himself, ‘I dreamt of this model and I want it out there now!’ I have lost count of the amount of devices that Samsung has put out this year alone! It is staggering! I particularly loved the S4 Zoom! The S4 Zoom is another Samsung handset that I would have loved to have as I enjoy taking pictures on my weekend treks! I can only imagine what the S5 Zoom will be like! I wonder how much of those units were sold. All I know is that they sold out in one retail outlet upon release! I know there is scope for this kind of device! I do think that Samsung is capable of delivering a better camera experience than it has done so far – not that I am complaining! But I know that the best is yet to come! Tablets... Well, we know that Samsung has the technology to usurp the iPad specs as shown with the Samsung Nexus 10 and the Galaxy Note 10.1 2014 tablets. Sales of Samsung tablets are up as, like their handsets, they have a great range in tablets. I personally would like to see HD resolution as a base standard! Samsung faces a lot of competition from Android manufacturers of the 7” variety! 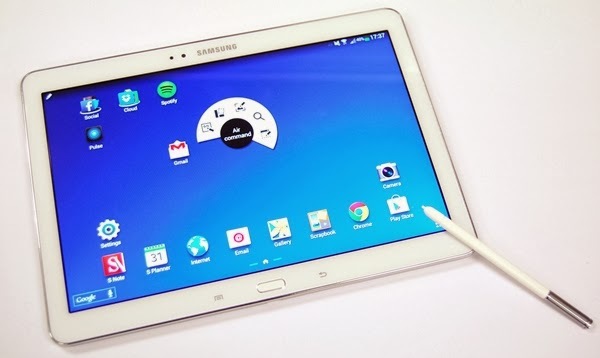 Rumour has it that Samsung are on the verge of unleash tablets of a “professional” nature! What that entails is anyone’s guess... I don’t want to speculate as I am often disappointed at the end result! 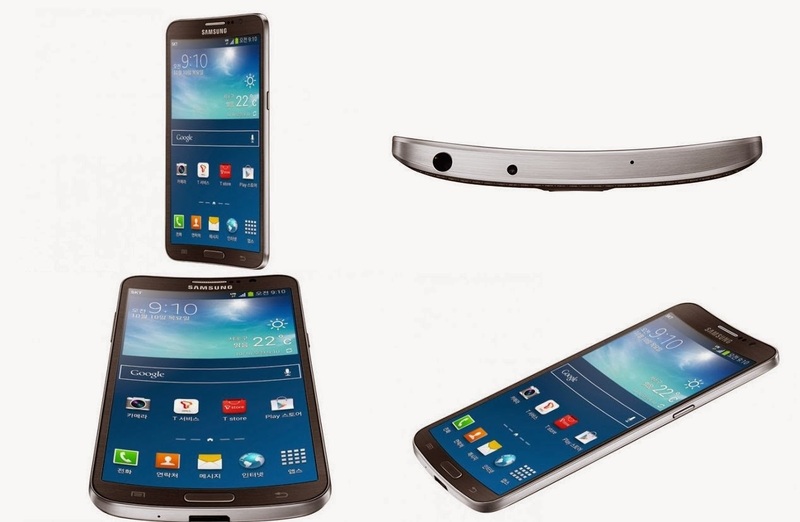 Will 2014 be Samsung’s year yet again? I think it will be! Who can stop them? SYNAPSE CIRCUIT: SOFTWARE GIFTS CHRISTMAS 2013 PART THREE: MAKING MUSIC! Magix Music Maker 2014 Premium. It's great for beginners but very capable of professional results! It features great virtual instruments and effects to boot! Good evening, Synapse Circuit Readers! Have you finished your Christmas shopping? No? There’s still time! I hope that you are keeping well and avoiding catching a cold or flu! Here’s the final installation of recommended software that will make for great Christmas gifts! In part 3 we will focus on music making software... The gift of music is so very, very special... It’s one thing to be able to play an instrument with manual dexterity – it’s awesome! And it’s something else to be able to manipulate music (or noise) with the aid of the computer! If you ever fancied making music or wish to give the gift to someone then check out the very best that software has to offer! Oooh, the wonderful news is that the online vendor, Synapse-Audio dot com, has a 25% off winter sale! Yay! What is Orion Studio? Ok, I am glad you asked! Orion Studio (8.5) happens to be one of the most powerful yet easy to use virtual recording studios on the market today! While it is true that it is possible to spend 3 or 4 times more on a digital audio workstation (DAW = another word and acronym for virtual recording studio) you will find that Orion Studio has it all: virtual music instruments, a mixing desk and various effects to add professional polish to the finished track! As with most of today’s music software you can extend the functionality through third party VST instruments and effects. VST stands for virtual studio technology as founded by Steinberg the makers of one of the earliest music sequencers that worked with physical MIDI based keyboards and synthesiser modules – including drum machines. What I absolutely love about Orion Studio 8.5 is the wonderful interface that works so very, very well! It’s an interface that works beautifully for musicians and non-musicians! 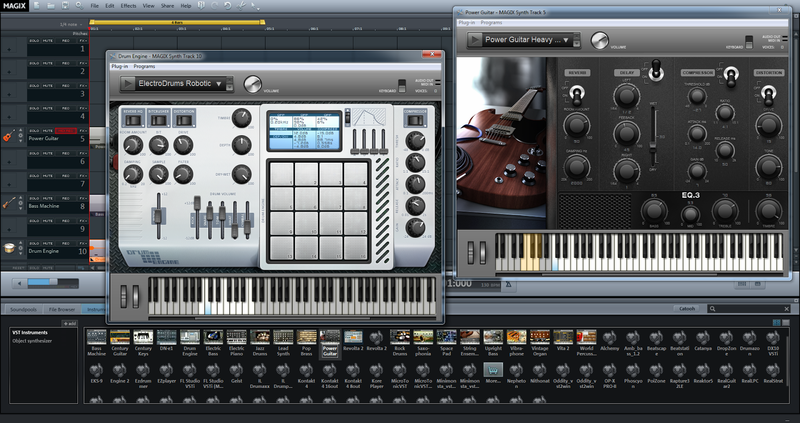 The MIDI editor is sweet! If you don’t understand the concept of MIDI editing do not worry because the interface makes working with entered notes child’s play! It has enough built in musical instruments and effects to get you going without needing anything else – but it always helps to have more to play with so to speak. So, if you wanted to make music for yourself or to encourage someone to get into music then this would be one to get for sure! Here’s a fantastic DAW from the ubiquitous multimedia company that is Magix! There are many iterations of Music Maker Premium and I would have to say that this is the best one barring the professional Magix range starting with Samplitude Pro X! Music Maker 2014, like Orion Studio 8.5, has a visually stunning interface that makes music composition a chinch! Music Maker 2014 Premium goes an extra step further in that it features video recording and editing capabilities too! Yes, alongside audio and instrument tracks you can video material! Awesome! It’s also stuffed with instruments and effects galore: synthesizers, drum machines and sample loops! Again, you can extend it through VST instruments and effects. What is great about Music Maker 2014 Premium is that it has a Mastering Suite! The Mastering Suite enables you to add a specific preset finish for the purpose of burning an audio CD, radio play and so on. Yes, good digital audio workstations come with mastering effects that, for example, can increase the volume levels to the max without distorting but not many of them are preset. Therefore, the novice can easily perfect a mix. I would definitely recommend Music Maker 2014 Premium to musicians of all abilities – especially the beginner! If you wish to spend less on a music program then I’d take a look at the cheaper but less functional Music Maker versions: Rock, Dance, Hip Hop and Soundtrack editions for £29.99. Then there’s the Lethal Bizzle version with samples of some of his tunes that’ll set you back £49.99. These Music Maker versions are great on many levels... For example, if you wanted to make a soundtrack composition for a video project you can do so easily. If you run a community youth project you will be able to get members to actively take part in music composition and so on. Over the years as a reviewer of many music software I can tell you that after a while the market gets saturated with software that it starts to get ridiculous! Some digital audio workstations vendors’ trade on the reputations forged in the development of personal home computing and emerging recording studios. As a result some of these vendors have placed a high price on their software and emerge as the industry standard. What has happened over the years is that other companies have come in and created cheaper software that could do more or less what the most expensive software could do. In turn the established companies responded by taking out some of the functionality of their main software and created products aimed at the budget market that had been established by the up and coming companies such as Magix and Synapse Audio! Also unscrupulous music technology magazines were keen to push the idea that you couldn’t consider yourself a professional unless you’re paying top dollar for the privilege of being a “professional”. Sure, £20 wasn’t going to buy you the best and most functional software in the world but you could make some tracks! Anyway, along came Cockos and REAPER! REAPER was a breakthrough program that was solid unlike so many would be contenders that fell by the wayside. What’s more REAPER was aimed at the professional minded and not happy amateurs like many others. REAPER did something unexpected and toppled the music software bigwigs! Sure, you don’t get as many instruments and effects but REAPER is so cost effective that you can easily purchase great instruments and effects. REAPER is pretty much aimed at the professional in mind is so inexpensive that the amateur with ambition can purchase it and produce great music! So, if you’re making money from your music you can afford to pay the full license. And if you are not making money the discounted license is a great gesture! I have used this software and it is brilliant! Audio Cleaning Lab is undoubtedly for the most fastidious audio professional. Typically of Magix the Audio Cleaning Lab sports a great user interface that allows you to clean audio at spectral level when there is other audio cleaning software that less than and cost so much more. Magix Audio Cleaning Lab 2013 is another giant slayer! Clean, restore and master until your ear is content! The price is gorgeous! Mac users will be pleased to know that there is a Mac version of this fabulous software! Well, I hope you have enjoyed the Synapse Circuit software selection for Christmas! Look what Serif DrawPlus X6 can do in 20 minutes! Good evening, Synapse Circuit Readers! As always I am hoping that all is well with you and that life is treating you well – exceptionally so! Almost every business needs some sort of paper based promotional materials such as a business card, complimentary slips, posters, flyers, brochures and so on. Please look no further than Serif PagePlus X7! I could very easily turn this mini review into a micro review because I can confidently say that PagePlus X7 is your only option and leave it at that. But I won’t! Have you ever started up a business and spent a considerable amount of money on promotional materials? I promise you that you will NEVER spend money on getting these promotional items designed again! You can also minimise your costs even further by printing cards onto Avery preset / pre-cut paper / card so that you can print what you need when you need it! How many times have you had cards printed out professionally only to be forced to print ex-amount for a discount? Well, those days are thankfully over! When you’re starting out you would want to minimise your costs as much as possible and you know that much of what you print for the purpose of promotion will be thrown away! What a waste! As your business grows you can invest more into promotion! When you are ready to print using a print shop / bureau PagePlus X7 will be there for you as it can output files that can be read at these print bureaus i.e. CMYK PDF! And because the software comes with a range of beautifully design templates you can be sure that you will find a design that you have in mind if you are not yet skilled as a designer. The templates are very easy to alter as you are taken every step of the way from inputting your business details to choosing a colour scheme, etc. I have used this program numerous times to create flyers and I’ve had no problems in printing what’s on my screen to the bureau printers! Back in the day professional printing would sometimes result in a totally different colour scheme to what you had on your screen! Not with PagePlus X7! You can also create small websites if your site doesn’t need to be complicated. An absolute must! PagePlus is the best desktop publishing software in its price range and it will not be beaten! Following on from PagePlus X7, assuming you have an interest in professional photo editing / manipulation beyond what’s in PagePlus then you ought to make PhotoPlus X6 your next investment! I can say without a shadow of a doubt that Adobe Photoshop is not the king of photo editing / manipulation software – especially in the context of the mobile application world! Today spending over £100 on photo editing / manipulation software is no longer practical on any level! It just doesn’t make sense anymore – not that it ever did! In this era of software pirating there is still something to behold about ownership! Serif makes you feel proud to own because from the start their prices of their award winning products have been very, very reasonable – sensible! Surely, such reasonable prices should be rewarded by purchasing their awesome software, yes? YES!! Just like all Serif products PhotoPlus X6 is no exception with regards to ease of use. It is very much like Photoshop – if ever you have used the onetime industry standard photo editing / manipulation software! If you are thinking of Photoshop Elements forget it! Photoshop Elements may be a little flashy when it comes to simplifying tasks such as backward removal but it does not support the industry print standard of CMYK that is synonymous with print bureaus! Again, if you are a novice at photo editing / manipulation there are great tutorials to follow! Awesome! I know, I know... It does look like bias towards Serif but the fact is that Serif produces the best easy to use design programs on the market today! Yes, there are others but DrawPlus is proven software for drawing / illustration! DrawPlus looks a little out of place in this selection because you would imagine that it is aimed towards artists / illustrators but that would be quite limiting. DrawPlus can be used in conjunction with the above programs for generating content for the promotion of your business. Of course, you could make a living as an illustrator! I had to include this drawing software in this category as it complements the above. Many people have the tendency to just stick with their photo editing / manipulation program and skip illustration altogether and I think this is a shame! A drawing program of this calibre and asking price can boost creativity and provide content for materials designated for print or digital such as animations for a website! Check it out! Every business should have a web presence as well as a social network account! Incomedia WebSite X5 Evolution 10 is one of the easiest web design programs I have had the pleasure of reviewing. Basically, the web page is presented as sections in which to place content i.e. images, video, text and so on. Therefore you can’t miss! It features a number of templates to get you going! Magix have come into multimedia in a huge, massive way that they have become formidable in amongst the competition! Web Designer 9 Premium is a fantastic web design program with great scope for professional looking design. At first it looks daunting but once you’ve understood the interface you will be producing awesome looking ecommerce enabled websites in no time! It comes with a great range of templates, widgets – including widgets for social networks and clipart! WebPlus X6 is a great web design program that is super-exceptional value because WebPlus X7 is out and I have yet to review it! Hopefully I will bring you a review soon! But if you are on a tight budget and you want an easy to use web design program that features an interface that acts like a DTP program then this is it! I find that WebPlus X6 combines sophistication with ease of use! It’s got the lot: templates, clipart, photo and drawing tools and so much more! Not forgetting ecommerce too! Build your site exactly as you want it! WebPlus is exceptional and to get it at less than half price is something to behold! Dare I say it you can purchase WebPlus X6 and upgrade further down the line! The Serif sales team will go the extra mile – if they can! Watch this space! Part three will focus on musical creativity! Good evening, Synapse Circuit Readers! Is it me? Or is it actually getting warmer (in the UK) instead of colder? Well, I managed to get my Christmas cards off in the post and I hope they will reach in time! Lol! As always, I have been unprepared this year... It has gone QUICK!!!!! Essentially, Photostory 2014 Deluxe is a brilliant software that allows you to transform your photos and video into beautiful presentation that you can share via DVD, Bluray or YouTube and other social media networks! If you have a Samsung Galaxy Note 3 you will be pleased to know that Photostory 2014 Deluxe can edit 4K video! The Galaxy Note 3 is one of the first smartphones to be able to record video in 4K – the next big thing in video! Whoohoo! What’s that? “I’m not good with computers...” Don’t worry about not having much experience and besides, if you don’t have a go at being productive on the PC how will you learn? Ah-ha! There are great templates included with this fab program so that all you have to do is fill it with your own content! Once done you can burn to DVD / Bluray or even upload to YouTube; sharing is caring! If your loved ones are far away and are missing out on, let’s say the development of your child or children then they will appreciate a personalized DVD / Bluray of your family events. So, if you have a digital camera, camcorder and / or smartphone full of media then you can rejoice as you will be able to put your media in context! You get the bonuses in the form of Reallusion CrazyTalk 6 Pro worth £109.99 and Sound Archive 8 worth £29.99. FANTASTIC!!!! What’s more if you have a computer with a touchscreen interface Photostory 2014 Deluxe will accommodate! There are two more different versions of this brilliant video editing software, Standard (£49.99) and Plus (£79.99) but I will always recommend the Premium version simply because it is the best and you also get some bonus programs to further enhance your creativity, proDAD Heroglyph V4 Pro and NewBlue ColorFas worth £350! Gosh!! 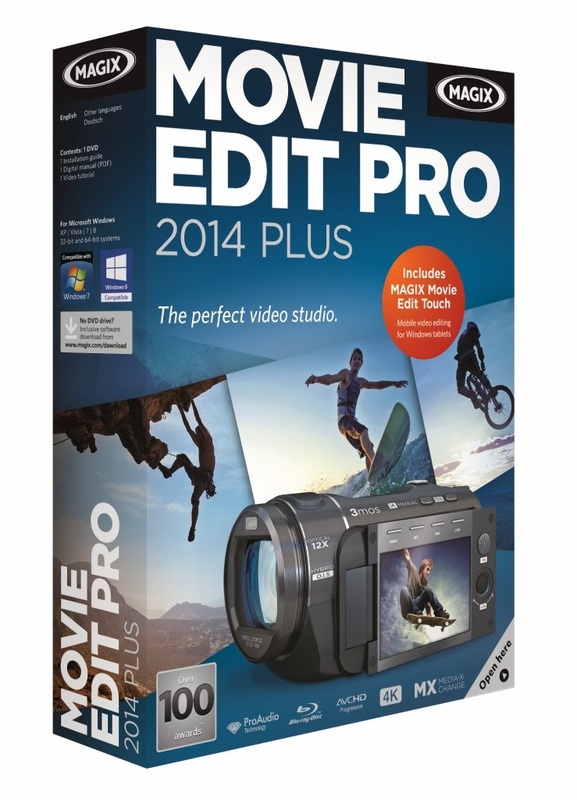 Like Photostory 2014 Deluxe, Movie Edit Pro 2014 Premium is future ready with the 4K video editing feature! I have used this program (along with Photostory 2014) and I can tell you that it is very, very easy to put together a video. Another thing to bear in mind is that once you have mastered the basics you would want to grow creatively; it would be such a pain to want to do some colour effects and you were not able to. Movie Edit Pro 2014 Premium is impressive in its scope! You’d be nuts to pass it up! Get it! Upload to YouTube, create professional DVD / Bluray discs with stunning menus! A must for video makers of all abilities! Have you ever wanted to create your own greeting cards for that personal touch? 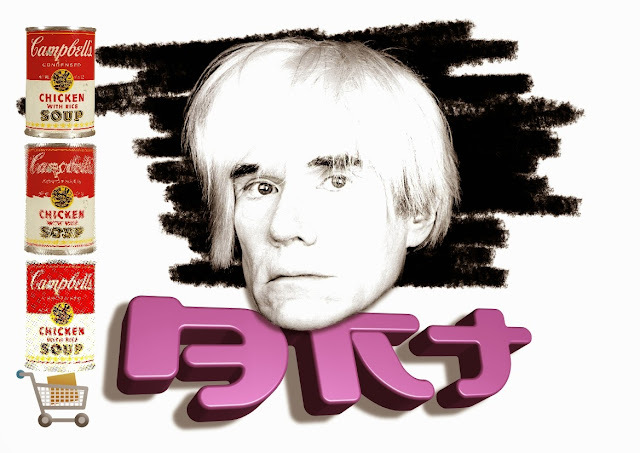 Well now you can with Serif CraftArtist 2 Professional! You can do much more besides such as scrapbooks, party invites, gift bags, etc. What I love about Serif software is that it allows the user to create without a huge learning curve associated with other programs. There are built-in tutorials that will make you adept at digital crafting or anything else function / task specific such as desktop publishing, web design and so on (we will come to those specialist software later on...). The price of CraftArtist 2 Professional offers exceptional value for money considering that it takes parts from their award winning DTP, photo editing and drawing programs (PagePlus, PhotoPlus & DrawPlus) and combines them into a fantastic treasure chest for anyone with a leaning for craft. And if you are a skilled craft artist your skills will be enhanced even further! CraftArtist 2 Professional is a must! Watch this space! Part two will focus on SoHo (Small office / Home office)! proDAD ReSpeedr Super Slow-Motion & Time-lapse Video Producer Application Delivers Amazingly High Quality Super Slow Mo Scenes and Time-lapse Videos. A Simple and Affordable Solution. ReSpeedr Utilizes Motion-Flow analysis, Optical-flow, and Dynamic Frame Blending Technologies to Show Incredible Detail in Super Slow MO sequences from up to 1,000+ FPS source video and Speeds-up Long Video Records to Enjoy as a Condensed Time-lapse. San Francisco, CA, December 16th, 2013 - proDAD, the highly acclaimed developer of digital video effects and image enhancement technologies for the video enthusiast and broadcast and professional market today announced ReSpedr. ReSpedr is a simple and affordable stand-alone Windows application for creating high quality super slow-motion and time-lapse sequences from videos shot on action cameras, DSLRs, mobile phones, and traditional camcorders. 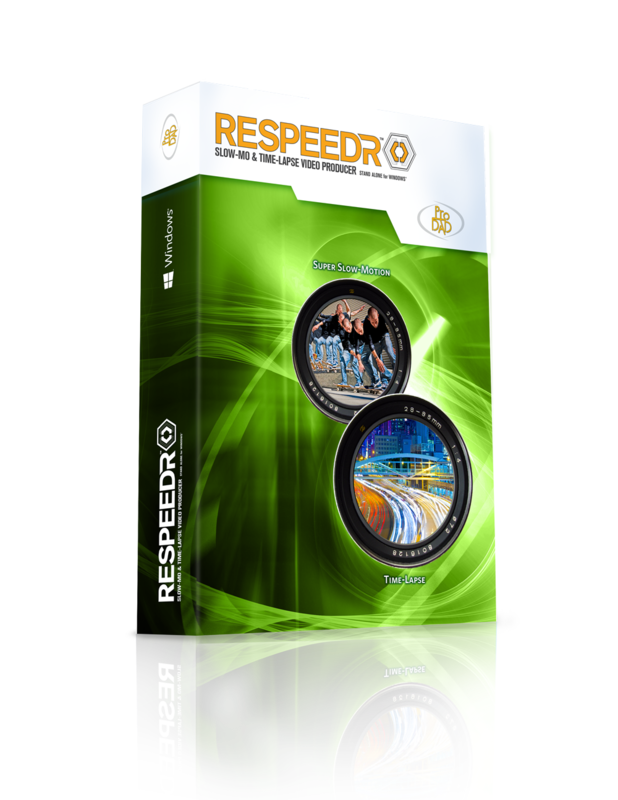 ReSpeedr employs Motion-flow analysis and can automatically determine to use Optical-flow or Dynamic Frame-blending technology to achieve ideal results with slow-motion sequences to bring out eye-popping details. Create amazing time-lapse scenes from very long videos to speed up the action and tell the story in a compressed timeline…you can even add slow-motion to a time-lapse with ReSpeedr. Previously to achieve the level of quality found in ReSpeedr, one needed to use very expensive Super Slow Mo cameras or use expensive professional-grade software tools. ReSpeedr changes all this by bringing professional-grade results to life with an easy to use stand-alone application for just £61.35 (special introductory offer). Not only does ReSpeedr yield great results, it also does it fast; with live previews and CPU/GPU support for faster rendering into industry standard formats; ready for posting or bringing into your favourite video editor. ReSpeedr features an intuitive timeline interface that makes it easy to experiment with different speed-up/slow-down settings and easy key framing too. Good evening, Synapse Circuit Readers! Have you done your Christmas shopping yet? You and I both know that when it comes to tech it’s best to wait until the last possible minute for bargains or wait until the following year for the latest products! In part one we looked at tablets aimed primarily at entertainment. Now we are going to take a look at tablets for productivity! WHAT’S WRONG WITH THE TECH MEDIA? For some reason the tech media can’t get their reviews right. Recently I saw a TV tech show compare the iPad Air to the Nexus 7 2013 along with other Android and Windows RT tablets; you can’t really do that. It doesn’t make any sense. They should have had the iPad Air compared with the Samsung Galaxy Note 3 10.1, Nexus 10, Asus Transformer Pad 10.1 and so on... Anyway, here are the best tablets for productivity! Again, with the (UK) tech press in mind, I don’t understand why this tablet doesn’t get the accolades it deserves. It is a great alternative to the iPad Air and it trumps the retina’s modest 2048 x 1536 resolution at 264 ppi with 2560 x 1600 298.9 ppi! The Galaxy Note 3 10.1” also features an octo-core 1.9 GHz processor to shift those intensive apps and 3 GB of RAM! Awesome! Not to mention the S Pen as you’d find within the Galaxy Note 3 phablet handset. I think the price is just about right! Now that quality of Android apps are getting every bit as good as what can be found on the Apple App Store the Galaxy Note 3 10.1” Wi-Fi is a desirable tablet indeed! It also rocks an 8MP main camera and 2MP secondary front facing camera! What’s there not to like? You can even expand the storage capacity up to 64 GB via microSD! The 16 GB version wasn’t available at the time of compilation. However, the 32 GB version of the Nexus 10” is awesome and comes in at a wonderful price! It’s made by Samsung and the spec is very similar to the Galaxy Note 3 10.1”! It also features a brilliant screen resolution of 2560 x 1600 300 ppi, 5MP main camera and 1.9MP front, plus 2 GB of RAM! The processor is a dual-core 1.8 GHz which should be fast enough to cope with demanding apps. The price is definitely right and I am sure there will be a Nexus 10 2013 or 2014 version, so it may be worth waiting for. Unless you absolutely need a tablet right now I would wait for a bit! The Nexus 10 is a remarkable 10” tablet that stands out in this crowded market! Here’s a fantastic Android tablet from Asus featuring: A 2560 x 1600 300 ppi ultra high resolution, NVIDIA Tegra 4 quad-core 1.9 GHz, 2 GB DDR3 RAM (1600MHz), 32 GB storage, microSD expansion up to 64 GB and 5 GB Asus Web Storage for life! In addition there’s a main 5MP camera and 1.2MP front facing! What’s more is that it features a USB 3 port! Cool! The Asus Transformer Pad (TF701T) is powerfully tripped out as the Samsung Galaxy Note 3 10.1” and coming in at a similar price. I like it a lot! It comes with a detachable keyboard which makes it close to a laptop experience! Apple’s Tim Cook has tried to deride the efforts of Microsoft’s tablets, “What? They are doing a PC and a tablet?” Or words to that effect... In some ways I can understand the dismissive attitude... Windows RT? C’mon! Microsoft has enough problems with Windows 7 let alone 8! Sure, I understand that RT is for the mobile phone but considering Microsoft initially had the concept of a tablet way before Apple so I reckon Microsoft would have been better off in restricting RT to handsets and leaving Windows 8.1 to run on tablets. Microsoft is in a position to mass produce Windows 8.1 tablets to make them inexpensive enough to undercut Apple’s iPad. The reason why I would go that extra expense for a Windows 8.1 tablet is purely because I am able to run real programs as opposed to apps! Not to be confused with the latest Surface Pro 2 tablet that is a major improvement, the Microsoft Surface Pro 10.6” tablet has very impressive spec: an dual-core Intel Core i5-3317U 1.7 GHz, 4 GB RAM, 128 GB storage with a 64 GB capacity via microSD and rather mediocre main and front cameras of 1.2MP! It is quite expensive but you do get the power of a PC in a tablet. Then the question is: why not get a laptop instead? Laptops these days, if you have been observing, have become thinner, more powerful and inexpensive! The latest Surface Pro 10.6” 2 starts at £719! Gosh! You get a better camera at least! If money is no object then the Surface Pro 10.6” 2 is the ultimate tablet – if you are a PC user! With the USB 3 port I would imagine that it would be easy to connect a DVD / Bluray drive to install the software that you have amassed over a period of time and get to use them on the go! It seems to me that Android has the advantage of not having a PC platform like Apple and Microsoft. Apple has essentially two operating systems: OS X Mavericks and iOS and Microsoft is the same with Windows 8.1 and Windows RT. Microsoft appears to be coming off worse for adopting the Apple model because the apps for Windows RT cannot compare to the Apple App Store. The high-end tablet, at the moment, comes across as a vanity device; you may think you need it but a decent laptop makes more sense. If money is no object then why not spoil yourself? For me, as an Android and PC user, I have a wider choice. I could go for a decent 7” Android tablet such as the Nexus 7 2013 model that I can use in conjunction with a PC and still have some money for a desktop or laptop. Or I could go for a high-end Android or the top of the range Windows Surface Pro 2! Either way I feel a winner! The tablet market is growing at a massive rate! What Android has done to the phone industry it is doing to the same to the tablet industry – bringing some confusion in its wake! We’ll get to the crux of the confusion during this article... Then there is Microsoft’s efforts, Windows RT and 8.1 Surface tablets and not to mention a few manufacturers creating their own Windows RT and 8.1 tablets such as Asus and HP. They are all chasing after one domain and that’s Apple’s iPad Air! No surprise there! The above prices is just for the Wi-Fi only version! As much as I like the iPad I find that it is too expensive for what it is. If you have such an outlay and you’re an Apple fan then there’s no doubt that you have made your decision already. Personally, I don’t see the point of making such an outlay for a tablet whereby the company produces Mackintosh computers. In a sense the iOS operating system on the iPad (iPad Mini and iPhone) is very much like Windows RT to the full blown Windows 8.1. Therefore, iOS is quite the same experience as the OSX Mavericks as found on Mac computers. I don’t see the sense in laying out over £300 for any tablet for portability when I could pick up a decent laptop with more power and real programs as opposed to apps! As great as the iOS App Store is I feel that you are paying a high price to play a few games, surf the web and to a little productive. Many children are making demands for the iPad this year and Mom and Dad may find that the iPad mini with a retina display is an alternative (to the iPad Air). Again, the prices aren’t much better. But an Apple fanatic on a budget may stretch this far. However, the ultimate iPad for the impoverished Apple user is the non-retina iPad mini which retails at £249 for the 16 GB Wi-Fi version. If money is no object then the iPad Air should be on your Xmas shopping list! Well, one of the many good things about Android tablets is that they are cost effective. It’s also one of the bad things too! Some of these sub £100 tablets are awful! The trouble with some cheap Android tablets is that the touch screen quality is poor as well as the materials. The advice is to stick with well known brands when choosing an Android tablet. THE FIRST QUESTION IS: WHAT DO YOU WANT FROM YOUR TABLET? The prices above is so very pleasing for a majority of people who are looking for a tablet for the purpose of entertainment. Naturally, there are apps for productivity on the Android platform and the tablet specific apps are growing quite rapidly too. Ok, the Nexus 7 is a 7” tablet in (as you probably worked out from the model name) in comparison to the 9.7” iPad Air and 7.9” iPad mini tablets – that’s what helps to keep the costs down! Do you really need such a screen larger than 7”? 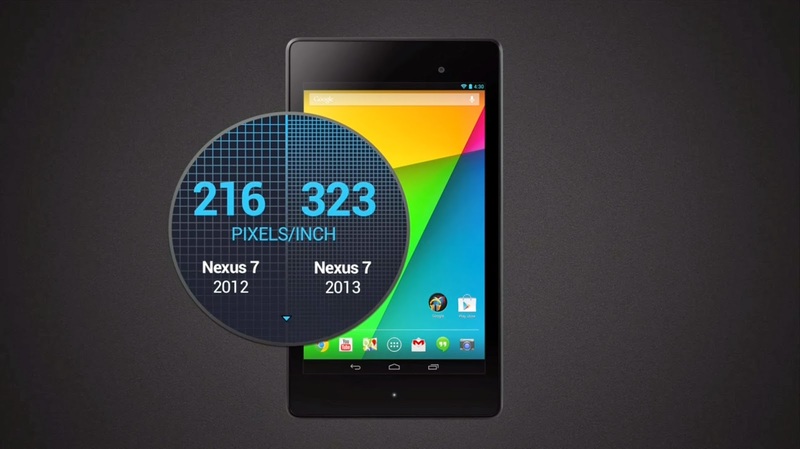 The Nexus 7 2013 has a wonderful 7.02" 1920 x 1200 HD display (323 ppi) – the highest on a 7” tablet! It also has a 1.2 MP front facing, fixed focus camera and a 5 MP rear facing, auto focus camera. The CPU is a quad-core Qualcomm Snapdragon™ S4 Pro, 1.5 GHz which means it’ll be fast enough for games, video and other multimedia apps. The one possible downside is that there is no storage expansion via microSD card; Google wants you to use their Drive cloud storage facility which isn’t really all that bad. If you’re on a budget you can pick up the Nexus 7 2012 model cheaply but you will not get the beautiful hardware that is the 2013 model! I would definitely make the Google Nexus 7 2013 my first choice for the purpose of entertainment. The spec is great and the price is right! I would probably go for the 32 GB LTE unlocked version so that I’d be able to insert a SIM card and take out a decent rolling contract with a good network. Well, it’s hardly surprising that Asus is the second choice as they made the Nexus 7 for and / or with Google! The MeMo Pad 7” is a great tablet for the money, £129! It features a 1.2 GHz quad-core processor and should be fast enough to handle games and today’s demanding apps! There’s external storage for up to 32 GB through microSD! And if that’s not enough Asus are offering 16 GB of their own cloud storage services for a year! Nice! The main camera is 5MP and the front facing camera is 1.2MP! It comes in white, pink and blue colours. The screen resolution is quite reasonable at 1280 x 800 (215.63 ppi) and should be pleasing to most eyes. Yes, it is Wi-Fi only and there are no models offering a 3G / 4G LTE network compatibility but at that price it does not matter at all! In fact you can always use your mobile phone as a Wi-Fi hotspot that will allow you to get this or any tablet connected to the Internet! Be aware that some networks do not allow this! Do check! Here’s a decent 8” tablet that is currently on sale in the UK, the Samsung Galaxy Tab 3 8”. It’s not as highly decked out with hardware as the Nexus 7 2013 tablet. For starters it features a dual-core 1.5 GHz processor and 8” 1280 x 800 (189 ppi) screen can’t really match the density of the full HD Nexus 7 2013 screen! But you can expand the storage up to 64 GB via microSD card. I like this tablet; it’s a nice design that resembles a large Galaxy S4 phone. It is a good compromise of quality of build and hardware. It’s certainly good for web browsing and keeping up with social networks. However, it may be that the dual-core 1.5 GHz processor may struggle with multiple apps opened at once and the more demanding games of late! Go to a decent retail outlet and ask to test it if your purpose is for games! The Galaxy Tab 3 8” comes in red, black and white. Now this has got to be one of the most inexpensive Wi-Fi and 3G compatible tablet on the market today! The Wi-Fi only model, the Iconia A1-810, costs £159.99! As you have probably figured out, the Acer Iconia A1-810 and 811 tablets are 7.9” and is very much like the iPad mini. The Acer Iconia A1-810 and 811 features a 1.2 GHz quad-core processor, 5MP main camera and the equivalent of a webcam 0.3MP front facing camera. The screen resolution is a just about acceptable at 1024 x 768 (162.3 ppi)! I say “just about” because for the purpose of entertainment the amount of detail in the screen should suffice. I found the Iconia A1-810 to be very useful for keeping up with social networking and surfing the net on the fly. This should suit the family fairly well! I think that the Iconia A1-810 and 811 tablet is a good compromise of hardware spec and cost. The 3G compatibility is awesome at £209.99! As you can see, 3G / 4G LTE compatibility comes at a greater cost with all tablets and more noticeable with the iPad models. Hey, the Lenovo IdeaTab S6000 10” has a good price tag for a 10” tablet! It features a quad-core 1.2 GHz processor, 5MP main camera and 0.3MP front facing camera. The screen resolution is 1280 x 800 - I am not sure about the ppi as it is not specified. However, I think it makes for a good family tablet as the 10” will make it easier to share the screen – especially reading an interactive children’s story. There is a 3G compatible version that brings the price up to £229.99 which is, again, great for being able to connect to the Internet and services on the go! The IdeaTab S6000 10” is a pretty decent entertainment 10” tablet that should provide fun for the family! The beauty of this and many Android tablets is that when the next model comes out the following year it is easier to part with it than with a table that costs over £300! Gosh! WHAT ABOUT TABLETS FROM AMAZON AND KOBO? Wow! That’s 64 GB for a brilliant £99.99! Let’s see... What do you get for the money? You get a 1.2 GHz dual-core processor, 1.3MP front facing camera – you don’t really need a main camera on a tablet. The screen resolution is a pretty decent 1280 x 800 with a ppi of 215! Not bad at all! It comes with its own eBook apps and you’re encouraged to purchase more reading material through its bookstore. This tablet is very much like the Nexus 7 2013 where high quality is concerned... The 7" screen is an impressive 1920 x 1200 HD+ (323 ppi) – I think that’s higher than the iPad! What powers it is a pretty powerful quad-core 1.7 GHz processor and a 1.3MP front facing camera. It’s a souped-up version of the Arc 7! The two Kobo tablets represents good value for money! Be aware that you can’t expand the storage via a microSD card. If you like consuming eBooks and magazines and want the familiar Android operating system then this could be a solution for you! The asking prices are very reasonable indeed! Stay tuned for part two: Productivity Tablets! You know something? Acer sometimes gets unfair reviews; I feel as though reviewers either didn’t understand some of their past efforts or didn’t want to. Sure, the efforts of Acer has been a mixed bag of power vs. features but with the Liquid S1 Duo I believe that Acer have come up trumps! Why? Good, I am glad you asked! I, for one, love those huge Android handsets. I am going to have an Android I would like it to be a big as possible without it being too difficult to hold! The Liquid S1 Duo is close to being perfect in the hand; it’s the smooth plastic battery black plate that makes it a bit of a slippery customer to hold. I wish it was rubberised in some way. It’s thin enough at 9.6mm and it is comfortable when taking video and photos. Yes, it is a mixed bag! Lol! However, it is a good mixed bag! Essentially, Acer have rebuilt the original Galaxy Note and made it a little more inexpensive new! You can pick up a new Galaxy Note for around £329. It’s a difference of £40 but a difference nonetheless. I guess that £40 would have gone into a stylus! But the whole thing works a treat! I found the Liquid S1 to be a very fast phone, the 8MP camera to very, very responsive which was a surprise given that some premium phone cameras can be quite fussy about taking night and HDR shots. With my Galaxy S4 I have to hold the camera rock steady for night and HDR shots otherwise the image is blurred; not so with the Liquid S1 Duo! I found the quality to be very good but not as good as the premium handsets aforementioned. Thankfully, the camera is a massive improvement than what’s on the Liquid E2 handset. One of the special features is voice activation; by uttering a phrase the Liquid S1 Duo is unlocked. Cool! It’s quite a neat (hee hee... GeekSpeak) feature but I would imagine that if someone with ill intent overheard that person could steal the phone and repeat the activation phrase. It would have been something if the handset could actually read an individual speech pattern. I wonder if a good impressionist could fool such a speech recognition system. Just like the Galaxy Note the Liquid S1 Duo can have several apps floating on the screen – even a call! I like it! 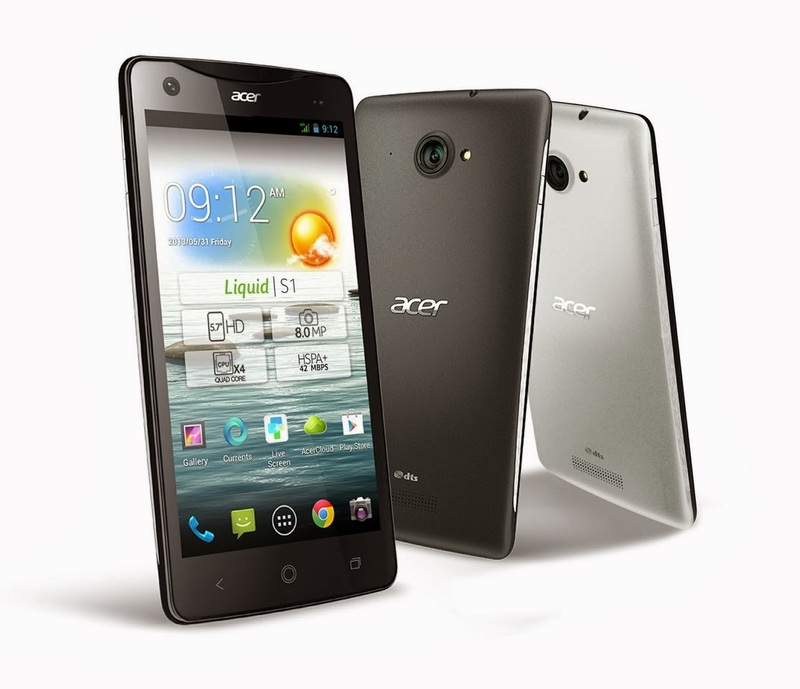 The Acer Liquid S1 Duo is a decent phablet with an attractive price tag! Unfortunately it’s not 4G compatible, it’s no big deal. Synapse Circuit / Blue Gene. Awesome Inc. theme. Powered by Blogger.